The American Red Fox (Vulpes vulpes) is thought to be cunning, curious and sly, with good reason. They have been observed storing food for lean times, using prepared dens of other animals and adroitly adapt to living among populations of humans. Members of the dog family, these agile, alert and hardy creatures weigh up to about 15 pounds, with the males ("dogs") being larger than the females ("vixens"). This photograph was taken on a cold, wet day in Hallo Bay, Alaska. 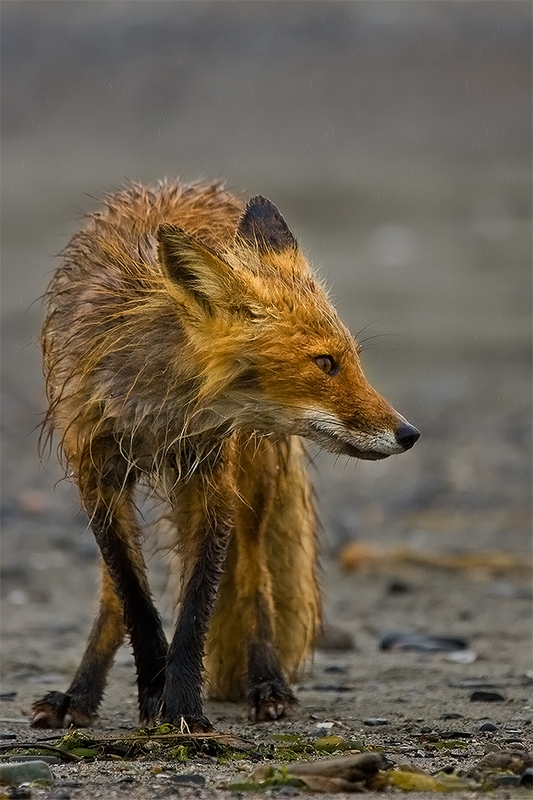 The fox was foraging for food along the Hallo Bay beach, wandering along the edge of the surf. The capture was taken at eye level with the fox, giving the scene an intimate perspective.